Dogs are our loyal, playful, energetic, goofy, and brave companions who color our lives with so much joy—now you can bring them to life on every page with this captivating compendium that celebrates the glory of canines throughout the seasons. From boxers, bulldogs, and beagles, to Pomeranians, poodles, and pugs, to shepherds, shih tzus, and Siberian huskies, this eclectic mix of original artwork showcases the many ways in which dogs warm our hearts no matter the season. Whether it's a spirited puppy romping through the first spring tulips, two golden retrievers sprinting against fiery autumn leaves, or a curious Lab leaving fresh paw prints in the winter snow, our furry friends color our world brighter every day. Inkspirations for Dog Lovers is a fitting tribute to the canine kingdom. Pages are perforated for easy tearing and sharing, to frame or hang on the fridge. We've also used "lay-flat" binding to manufacture the book which eliminates that annoying bulge in the spine when you open a book. Dogs infuse our lives with color: true blue loyalty, sunny yellow dispositions, and bold red courage. They are our best friends; faithful companions who will patiently lie at our feet and listen to our heartfelt confessions, then are instantly ready for a romp in the rain or a quick game of fetch at a moment's notice. In this tribute to the dogs in our lives, you will find myriad ways to bring your special creative touches to these distinctive, original pieces of art. Experiment and have fun; start simply or customize your piece with doodles and flourishes; use realistic tones or a rainbow of hues—it's all up to you! Paired with inspiring quotes about the wisdom of dogs, we hope this book allows you to unplug, unwind, and discover talents you didn't realize you had. Coloring is supposed to be a stress-free, no-worries activity. There really is no right or wrong way to do it. But if you'd like to take it to another level, here are some step-by-step instructions and helpful tips that can take your pages from mundane to magnificent, as you can see in the example on the following pages. Step 1 Pick your palette. For this example, we chose mocha and tan tones for the dog. If using pencils you can get different variations of the same color by applying more or less pressure with the colored pencil. Begin with light pressure and then use a heavier hand if you want a more intense shade, or add more of the same color on top to get the layered effect that will add interest to your picture. Step 2 Think about the light source in your picture; the shading of the fur depends not only on the color of the dog but the way that the light is hitting the dog's fur, and from which angle. Light and shadows add depth to the drawing. Step 3 As you color, make certain that your strokes go in the same direction that the fur grows on a dog. It's easy to see this in most of the illustrations. Step 4 Start with the lightest colors, deciding where those areas will be, and do them all first. Then continue coloring—in the direction the fur grows—with the rest of the colors in your palette. Keep in mind that it is easier to start light and go darker than to try to make an area lighter. Step 5 Finish off the fur with the darkest color, keeping in mind your light source. Step 6 Step back and look at the picture from a distance and you will see if you need to add any more details. Step 7 Color in the eyes and nose to complete the dog. ©2016 HCI Books. All rights reserved. 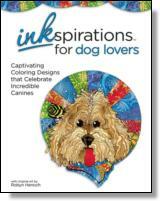 Reprinted from Inkspirations for Dog Lovers: Captivating Coloring Designs that Celebrate Incredible Canines. No part of this publication may be reproduced, stored in a retrieval system or transmitted in any form or by any means, without the written permission of the publisher. Publisher: Health Communications, Inc., 3201 SW 15th Street, Deerfield Beach, FL 33442.